Scientists have revealed a new link between alcohol, heart health and our genes. In our last post you heard a bit about the role of titin truncating variants (TTNtv) in dilated cardiomyopathy, but we had lots more questions at the end. Well, we’ve now completed a major study of the clinical outcomes of patients with TTNtv. In the research, recently published in the Journal of the American College of Cardiology, 716 patients with DCM, including 83 patients with TTNtv, were followed up for a primary composite outcome of cardiovascular death, major heart failure events and major arrhythmic events. We found that there was no difference in outcomes between patients with and without TTNtv (5 year event rate for TTN positive/negative patients: 10.4%/13.6%, p=0.65). This study suggests that having a TTNtv doesn’t affect your outcome in DCM. It shows that TTNtv DCM doesn’t have the adverse event profile associated with other genetic cardiomyopathies such as lamin cardiomyopathy. This is potentially really useful information for patients and clinicians. But does that mean there is no role for titin in risk stratification in DCM? Not quite. The first point to note is that the patients in the study were largely in NYHA class I/II, with moderately impaired ventricular function. Secondly, whilst this was the largest single center study of patients with TTNtv DCM with independently adjudicated outcomes and CMR phenotyping, the overall follow up time was 3.9 years (median). This is considered medium term follow up. Maybe we were a little early and longer term follow up will reveal differences that this study did not. Finally the number of the events within the cohort was lower than previous studies, not just from registry data but also historic studies in our institution. This suggests an improvement in DCM outcomes overall (note – this is a good thing for patients). Therefore it is possible that longer follow up in patients with a higher risk for adverse events could reveal subtle differences between titin positive and negative patients. Some previous studies have suggested that there is a difference in outcome in male patients with TTNtv compared to female patients with TTNtv. TTNtv may well have a different effect in some groups e.g. women, patients with fibrosis, but the number of events in our study meant that we could not definitively analyse this. Multicenter studies will be the way forward. On a general point, I would advise caution when interpreting studies that analyse data in only a subset of their cohort (e.g. survival analysis in only the patients with TTN and not compared to the entire DCM cohort – you may end up just picking up a DCM effect and not a TTN specific effect) or those that present survival analysis from birth (this works for hard outcomes e.g. death, but doesn’t work for outcomes such as heart failure hospitalisations, as you can’t be sure the patient didn’t have an event before they enrolled in your study). Today we are very pleased to announce the release of CardioClassifier (cardioclassifier.org), a web-tool to support interpretation of variants identified in genes associated with inherited heart conditions. In this blog post we describe a bit about the project, our motivation for creating the tool, and how you can get started. Why did we create CardioClassifier? Genetic testing for inherited heart conditions is commonly available in the clinic. It can be used to help diagnose disease, direct patient management and for screening in relatives. Although DNA sequencing is now relatively routine and straightforward, the major challenge in genetic testing remains interpreting the identified variants. Why is variant interpretation such a challenge? The genetics of inherited heart conditions is complex with multiple genes implicated in each disorder. Although there are a few recurrent variants that are identified in multiple cases, disease-causing variants are often unique to one individual patient (and their family). As each one of us carries thousands of genetic variants, identifying which of these have the potential to be disease causing can be a challenge. Interpreting a genetic variant can feel a bit like a forensic investigation; we ask a lot of questions and collate all the evidence we can find. Has this variant been seen before? If yes, was this in a patient with the same disease or in healthy individual(s)? Can we predict what effect this variant has on the protein? Does the variant reside within a region of the protein known to perform an important function, or where we commonly see disease mutations? Is this variant seen in all individuals with the disease in the family? In January 2015, the American College of Medical Genetics and Genomics (ACMG) and Association for Molecular Pathology (AMP) jointly released a set of guidelines aiming to standardise this process . They outlined exactly which questions we should be asking (28 to be exact) and how much weight we should give to each answer. Although these guidelines were a huge step forward, they were developed to apply to any variant in any gene and in any disease. In reality, the exact questions we ask and the exact places we need to look for the answers are highly disease dependent, and as such, the guidelines need to be curated for each disease. But doesn’t this all take a lot of time? You might be thinking that this all sounds like an awful lot of work, and you would be right; interpreting a variant requires collecting data from a multitude of different sources and integrating this all into a final decision. In fact, this is what clinical scientists in genetics labs across the world do every single day. So where does Cardio Classifier fit in? We set out to make a bioinformatic tool that would make the process of variant interpretation both easier and better. By adding in some automation we can standardise the process and collect a lot of the data required to interpret a variant all in one place. Great, so how do I get started? 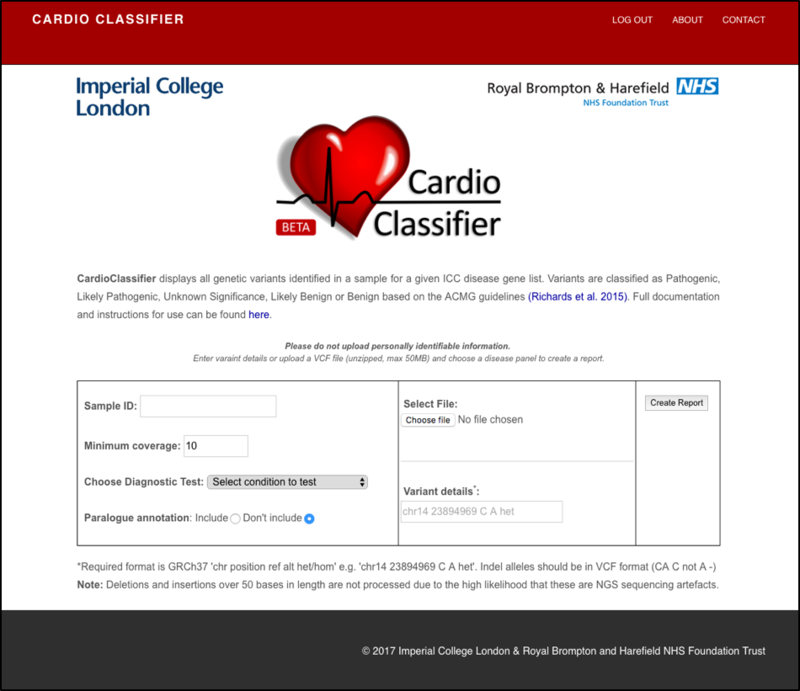 Head on over to cardioclassifier.org, click ‘REGISTER’ and enter your details. After accepting the licensing terms you will be sent an email to confirm your email address (please check your spam) before your account will be activated. In the left side of the box, (i) add a sample ID of your choice (NB do not use patient identifiable information) (ii) choose from a list of 11 diseases (the disease you select dictates both the genes analysed and the disease/gene specific thresholds used). In the middle section add your variant details. You can either upload a single-sample variant call file (VCF) by selecting ‘Choose file’ and browsing on your computer, or you can enter variant details in the box below. If you are stuck for something to try for now, enter this example into the box ‘chr14 23894969 C A het’ and select ‘Hypertrophic Cardiomyopathy’ as the diagnostic test. Click on ‘Create Report’ and wait for the magic to happen! The upload page gives you the option to include ‘paralogue annotation’. If you select this option, your variant(s) will be assessed against two new criteria utilising known disease-causing variants in related genes/proteins (paralogues) . Full details can be found in our documentation (link on the variant upload page). Since this evidence is not currently included in the ACMG framework you need to opt in to include it. Why can I not search for any gene and/or disease? We have invested significant effort into defining if each individual rule should be assessed, and what threshold should be used, for each individual gene and disease pair. We have therefore focussed on 40 genes with robust links to 11 diseases and genes where we are confident we know something about the mechanism through which they cause disease. We will expand the list of genes as more data becomes available. Details of disease and genes included are in the tool documentation (link on the variant upload page). 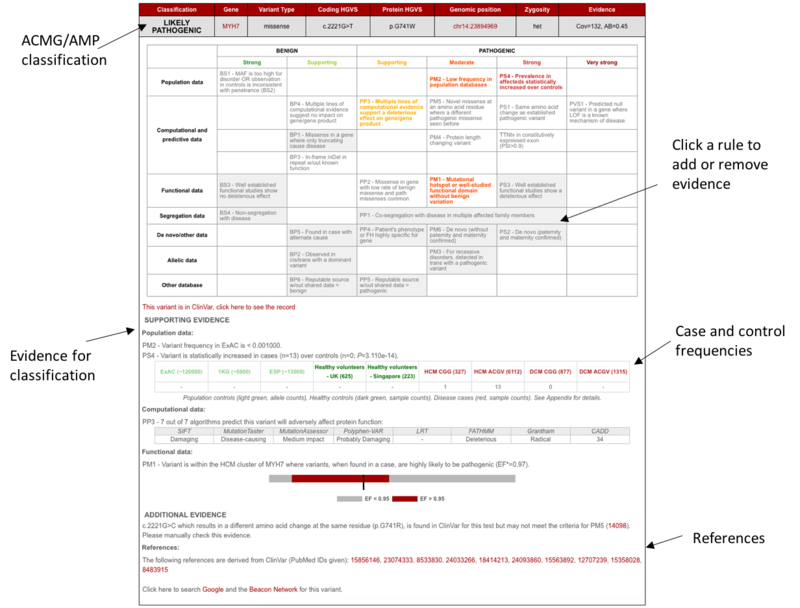 The top half of the box is a representation of the grid from the ACMG/AMP guidelines with each rule that has been activated for this variant shown in colour. Boxes with a grey background represent rules that cannot be computationally predicted and that require user input. This grid is fully interactive – click on a box to add or remove it as evidence. The bottom half of the box displays the evidence that went in to assessing each of the ACMG/AMP rules, including case and control frequencies and links out to various external resources (PubMed, Google, ClinVar, UCSC, ACGV, ExAC and the Beacon Network). To complete the classification of your variant(s), follow the links out to publications and ClinVar to find any reported clinical or functional information. Use this, along with any information you have about your specific patient/sample, to activate any rules that have not been activated automatically, by simply clicking on the rule you want to activate. When activating (or deactivating) a rule you are given the option to include a comment – anything you add in this box will appear at the bottom of the variant report under ‘Manually added data’ as additional evidence. Each time a rule is adjusted, the overall variant classification in the top left of the box is re-calculated according to the ACMG/AMP logic. The data you add at this step is not currently stored, however, the ability to save and return to previous annotations is the first in our long list of features to add to the tool! We have included some more instructions, including file format requirements and details of how we have parameterised the rules in our documentation. There is a link to this on the file upload page. If you are still stuck, or you find a bug, please email us on cardioclassifier@gmail.com. Our aim is to make variant classification with CardioClassifier as easy as possible and constantly adapt it to include new data as it becomes available. As expert groups, such as the ClinGen resource (www.clinicalgenome.org), release guidelines specific to individual genes or diseases, we will build these into the tool. We will also be adding case-level and functional data for a set of highly curated variants. As mentioned above, in the near future we will add functionality to save the annotations you add interactively, so that when you return to the same variant again, you do not have to repeat all of your hard work. In these ways we hope that CardioClassifier will become a highly curated knowledge-base for variant interpretation in inherited heart conditions. Developing and releasing CardioClassifier has been a huge team effort by the Cardiovascular Genetics and Genomics team at Imperial College London, the Royal Brompton Hospital and the Medical Research Council London Institute of Medical Science. We are also grateful to our funders; the British Heart Foundation, the Wellcome Trust and the Department of Health.